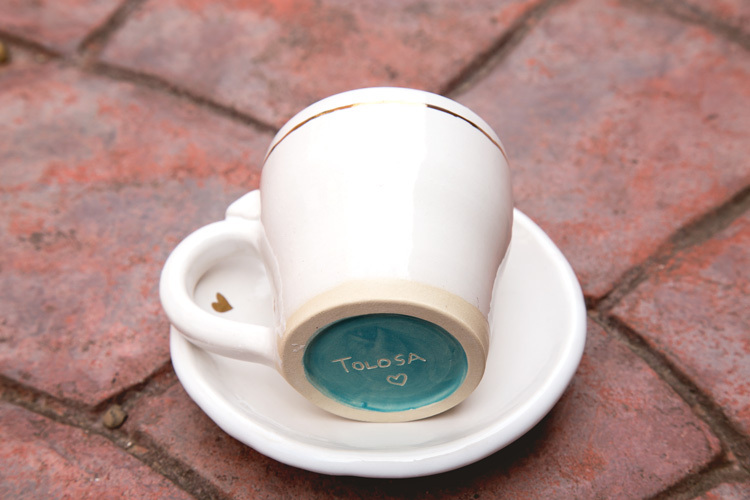 This month brings our Rosemary subscribers something to make the mornings a bit brighter and to delight coffee lovers with a lovely handmade espresso cup. 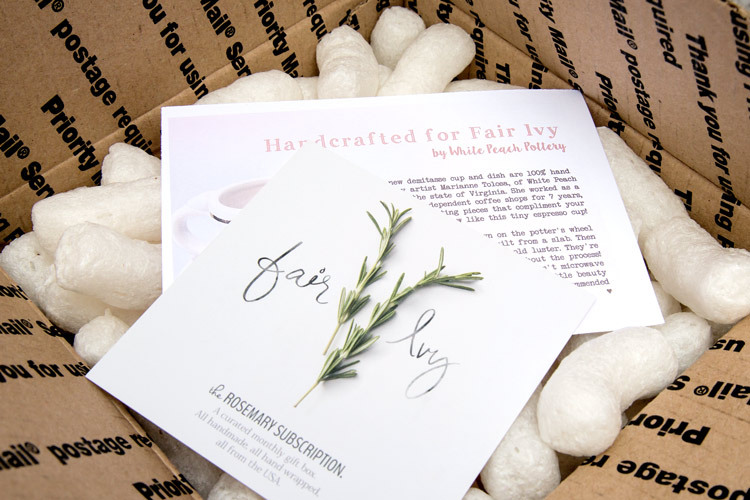 Like all of the items in our gift subscriptions, the March surprise is made by hand and packed with care. 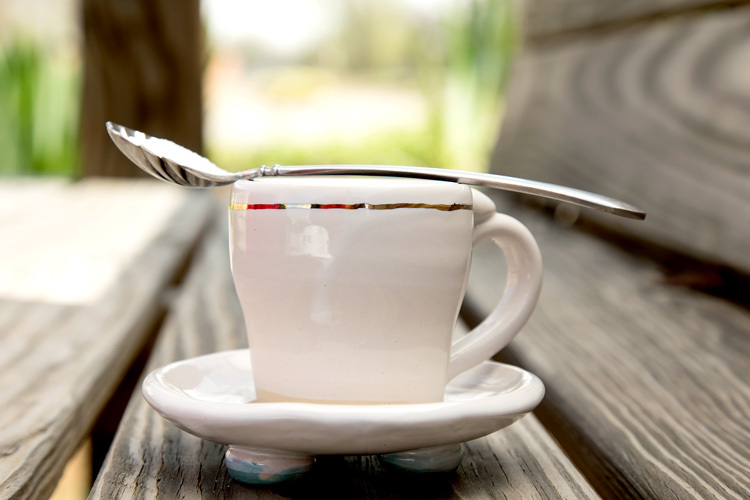 Scroll down to find out more about this month’s Rosemary subscription, the artist of the month and the demitasse cup chosen exclusively for our Fair Ivy members. Even before the box is opened, you know it has something special inside. 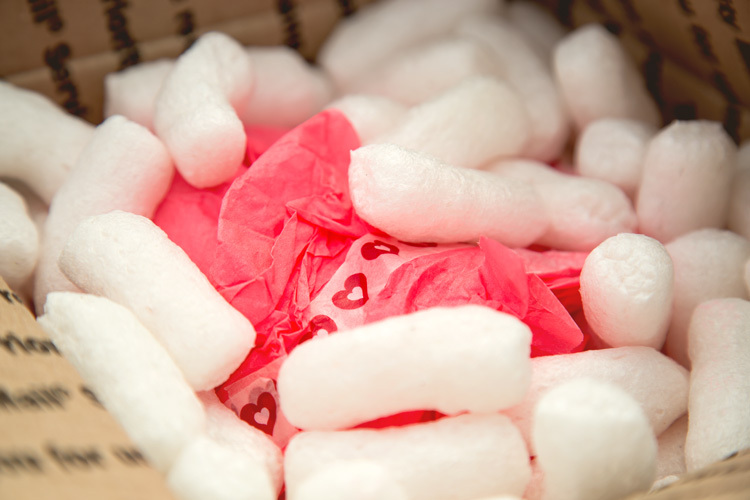 Resist the temptation to shake- contents are fragile! 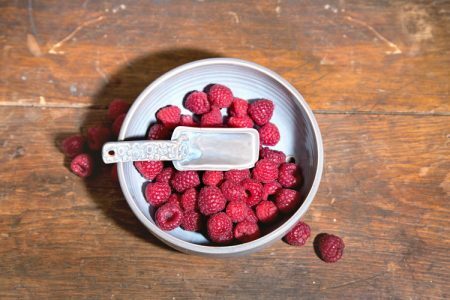 The first glimpse inside the March gift box gives our Fair Ivy subscribers a glimpse into the creative process and a bit of info about the artist of the month, Marianne Tolosa of White Peach Pottery. Be sure to read the artist card for care tips and an exclusive code to use in her online shop. Just a peek of colorful wrapping and whimsical hearts. 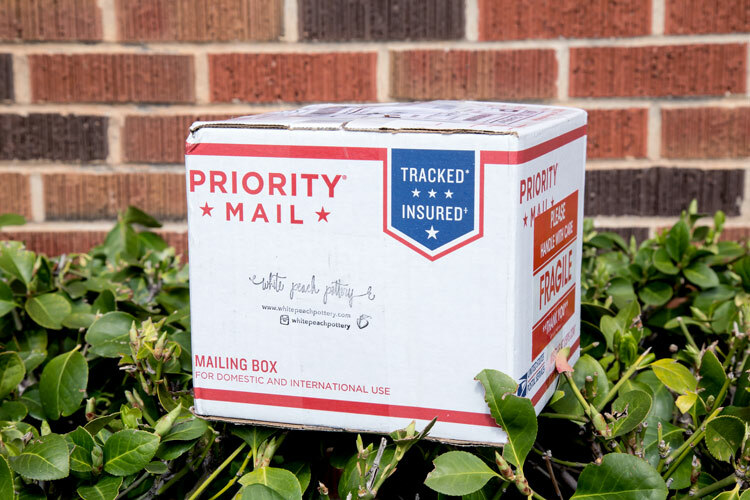 Carefully wrapped, this surprise is just waiting to be opened. This petite espresso cup is hand crafted on a potter’s wheel, fired three times and painted by hand with 14K gold luster. 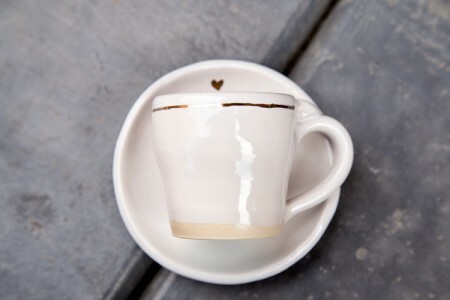 Accompanying each demitasse cup is a matching dish, formed from a slab and decorated with a heart of gold. Marianne Tolosa is the artist behind White Peach Pottery and is based in Virginia. 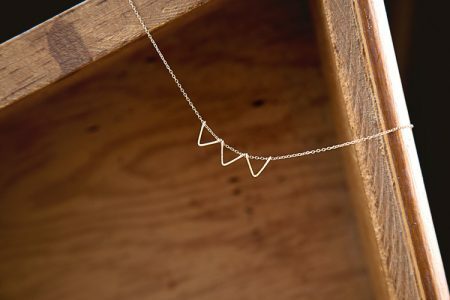 Her work is influenced by Japanese techniques and the natural beauty that surrounds us, resulting in pieces that combine simplicity with whimsical touches and are designed to make everyday moments special. To see more from White Peach Pottery stop by her shop where she offers handpainted pottery pieces crafted by hand, one at a time. Like the espresso cup made just for our Fair Ivy subscribers, all of her items have simple lines with touches of color and unexpected whimsy. 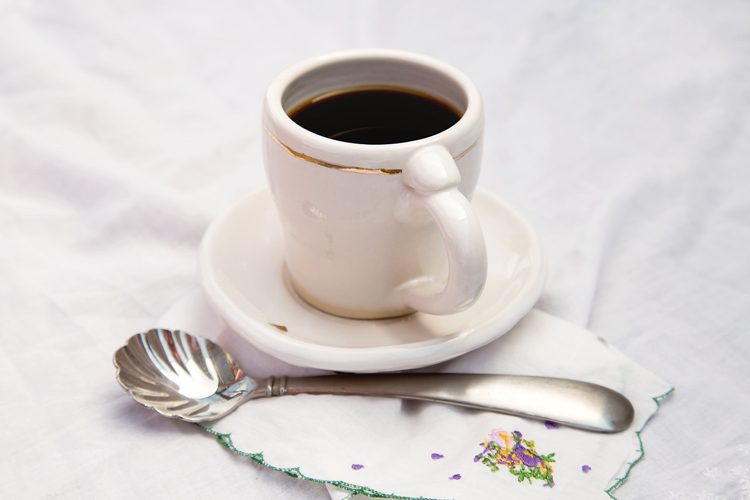 We hope you enjoy this piece of handmade pottery and find that this demitasse cup brings joy to your morning routine.